You look wonderful in that shade!! Very summery and happy looking. love that pastel yellow it's so nice and summery, love your blazer too! I love those pants! I'm not sure if I could pull off the yellow pants, but you look so chic! Yellow really suits you, in fact every colour you wear suits you! Ah I adore yellow - it's always so summery! Even in the winter! Love you in those chinos. 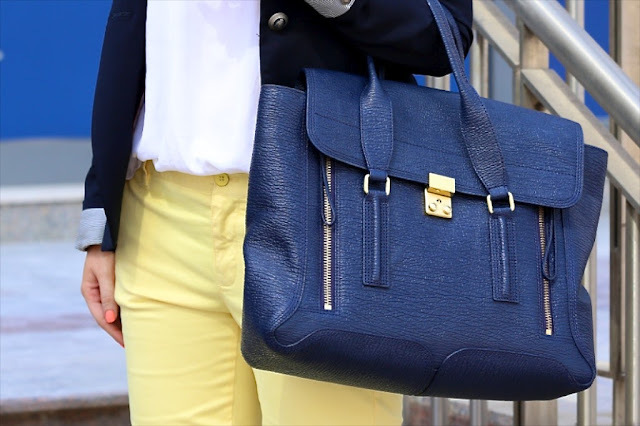 The yellow looks great paired with the navy. I agree, you have to be so careful with paler colours! Ooh I like these Never really thought about wearing yellow! I love the look! The shoes look amazing as well. Are they super uncomfortable? For some reason I always thought the more expensive the better quality and therefore a more comfortable shoe. Very cute look! I always loved your style. Perfect outfit! Yellow and blue are a fabulous pairing. I like that yellow a lot though I think it would look absolutely awful on my skin tone unfortunately! beautiful outfit!I love wearing yellow all year around but when Summer comes I like to wear it in acid brights!. I adore these, I just bought a pair of yellow polka dotted skimmers from GAP recently and I adore them, they're so comfortable. I'm totally in love with GAP skinny jeans although it is too hot to wear them right now. They are such good quality! Ahh, can't beat some lemon - beautiful! AHH I love this outfit. Ive been looking for a pair of nice yellow trousers for some time. That's so adorable! I just bought a pair of pink pants from gap that I am in love with as well!! I love colorful pants for summer! I just did an OOTD on my blog with bright green skinny jeans! This yellow one is the perfect shade! i really like your bag !!! Yellow is my favorite color and I love those pants! I have to get them!! I'm loving these yellow trousers! I'm pretty tempted to divulge into the world of yellow but I'm milk bottle pale. What do you suggest for us paler ladies - brights or pastels? See our Getting Started Guide for aid with EasyPost DHL Tracking as a worldwide choice, or as a main European partner.